Whether it’s a planned re-decoration or a re-decoration job that you’ve just completed, there might be a problem. Because, it’s at one of these two stages that old pine furniture just doesn’t seem to go well with the new decor. Perhaps it’s the newness the new paint on the walls, doors and skirting! And, the obvious contrast with the yellow/ orange tinge of your pine furniture. But there’s a solution. And we know that, because we are often asked to paint old pine furniture when there’s home decoration planned…or it’s just been completed. 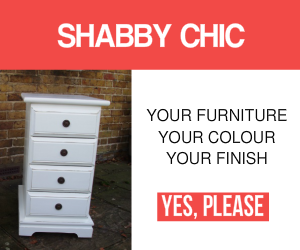 Painting furniture is an easy, simple and effective way to go. 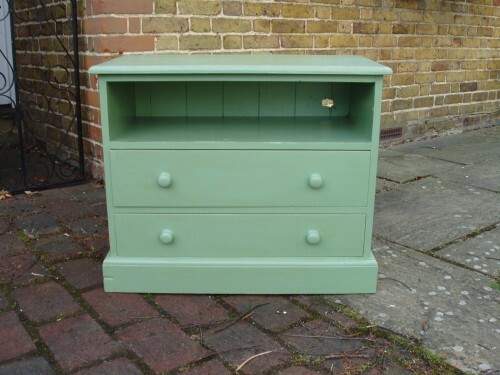 With this example, green was the chosen colour for an old pine cabinet. Farrow and Ball‘s Breakfast Room Green was selected to work with Farrow and Ball’s James White emulsion paintwork on the walls and skirting. 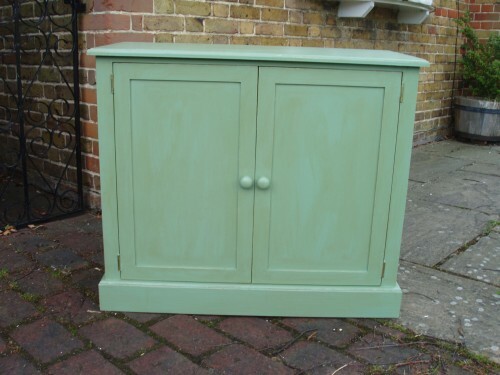 We gave the green painted cabinet and its TV cupboard companion several coats of Breakfast Room Green before finishing with a layer of dark wax to seal the finish. Dark wax isn’t always a preferred choice but it really works well with the Farrow and Ball dark colours. It’s an effective choice for the blues, greys and greens in the palette and is an instant ageing application that preserves the colour base. Both the green painted cabinet and the green painted TV cupboard are now in situ in their newly decorated home. The contrast with the James White walls is very effective. We all know that neither piece of furniture was a family heirloom! But a green painted base has set them up for a whole new lease of life. When you have a similar project then please be assured that we can always help. So, when the time is right, please don’t hesitate to get in touch.